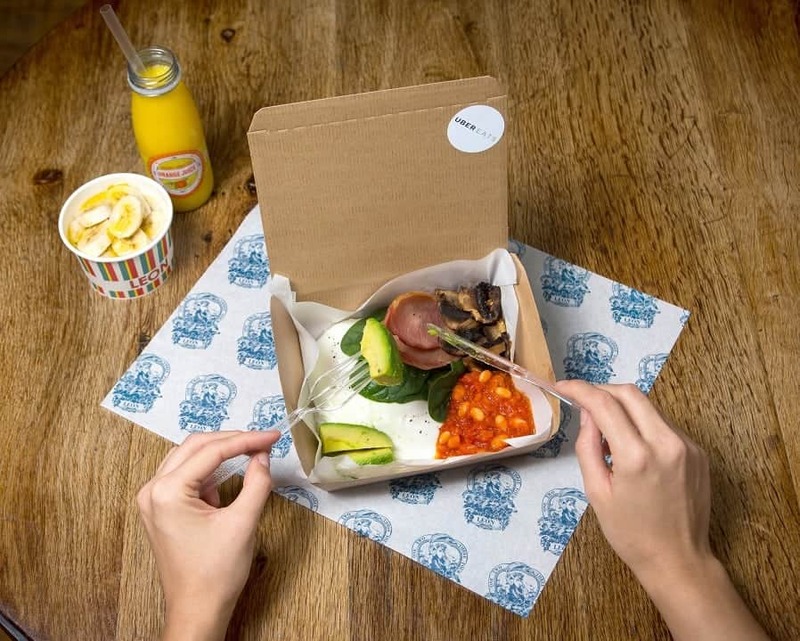 Uber Eats are now delivering a ‘morning after’ cure – in a box. As the Christmas festivities kick off around the country, experts at the food delivery firm have carefully crafted a breakfast which aims to help festive revellers survive the peak of the party season. And it is accompanied by banana porridge drizzled with honey with a side of orange juice. The choices for the breakfast box help to restore essential nutrients to help people spring back after a heavy night at the pub. Vitamin B in the mushrooms and beans help replenish those lost during the consumption of alcohol. And the eggs and avocado aid the recovery of the liver by flushing out toxins and reversing the effect of alcohol. Bacon helps replenish amino acids to help with brain functionality and the spinach neutralises stomach acid to be rid of that sick-feeling Brits experience the morning after a big night out. The banana and honey porridge help to restore potassium and magnesium, with the carbs boosting serotonin, which counteracts ‘booze blues’ by introducing ‘happy hormones’. And to top it all off, a glass of OJ replenishes glucose lost during drinking – speeding up the body’s processing of alcohol. The rejuvenating brealfast was designed by gastrophysics chef, Jozef Youssef. Uber Eats have partnered with the innovative chef and restaurant chain LEON to create this ‘Fix Up Feast’ fit for festive party-goers. Kitchen Theory founder and chef, Jozef Youssef, said: “I love creating dishes that not only taste delicious but are scientifically proven to do good. “I’ve had a lot of fun working with Uber Eats and LEON to create the Fix up Feast menu. A spokesman for LEON said: “We don’t believe in self-denial and enjoy the first to last glass of wine on a good night out. Toussaint Wattinne at Uber Eats comment: “At Uber Eats we’re passionate about breaking the stereotype of food delivery, by making food for all occasions in any location available at the touch of a button. Uber Eats is free to download from the app store and it’s available on Apple and Android devices. The Fix up Feast bundle will be priced at £9.45 and available between 8th December and 22nd December.